Private Security Coys Operate From Police Hqrs? The allotting of office space to private security companies to operate at the National Police Headquarters in Accra is raising much public concern. Currently, two private security companies, the Central Monitoring Station (CMS) Limited, a subsidiary of E S Security System and Coact, both electronic security service providers, are doing business from the Information Building at the Police Headquarters. Some individuals within the security setting have condemned the practice, saying this was not allowed anywhere in Europe or the Americas. They said the National Police Headquarters played a very sensitive role in the national security network and allowing private companies to operate from there individually gave cause for concern. CMS and Coact install electronic security systems to the homes and businesses of their customers. The devices are monitored from their offices at the Information Building at the Police Headquarters. In the event that there is an intruder the customer presses a signal button, which is read at those offices. The police are dispatched to the rescue of the customer. According to those who have expressed worry over this " marriage of convenience", it had the potential of generating conflict between the private security personnel and the police over roles. Mr. Awoonor Renner, chief executive of K-9 security company and chairman of the Association of Private Security Organizations (APSO), told The Chronicle that in Europe if one was not a policeman, a cleaner or a criminal one could not go beyond the counter bar at a police station, a system which he apparently believed was being compromised by granting an office space to individual private companies to operate at the central police command base. He said it would probably be acceptable if the companies were allowed to fix a monitoring system there in the event of a burglary, for example, but not to operate from there as was being done now. "Doing a joint venture is very wrong", he added Dr. Emmanuel Aning, Executive Director of the African Security Dialogue and Research (ASDR), on the other hand, stated that granting an office space to private security companies was, in itself, not wrong because the Police Act (350) of 1970 as well as the Archer Commission called for a police and private security collaboration. However, he said it would have been more appropriate if such arrangements were done through a body like the APSO, which represented majority of the private security companies. But neither CMS nor Coact is a member of APSO. In fact none of the private electronic security companies is a member of the association. Both CMS and Coact said they were in a partnership with the police and were not operating independently. They also questioned the concern being raised about using the police to aid their business saying, their affiliation with the police was intended to help them combat crime. 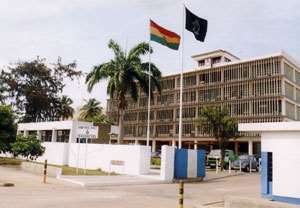 According to Coact director Kwaku Bawuah, they found the premises of the Police Headquarters ideal for their operation because of lack of proper address, numbering and lighting systems in Accra. He said operating from the police base made it a lot easier to alert the police and give directions to crime scene. He said his company applied and was granted the office space during the tenure of former Inspector General of Police (IGP), Peter Nafori. CMS boss, Emmanuel Ghanney also said he got access to the office through Mr. Ernest Owusu Poku, the immediate past IGP and although according to him his partnership document was yet to be formally signed, he had carried out extensive renovation of the information building. CMS vehicles have the inscription "Police Rapid Response" with civilian license plates. Meanwhile in a response to The Chronicle's enquiry, the police said granting permission to the two security firms was under a pilot project "to provide subscribers a quick response from the Police in case of criminal attacks and in other emergency situations." The Police Public Relations Director, Mr. David Eklu, in a signed statement said what was different was that the companies were using an electronic device that automatically triggered an alarm to alert the police for a quick response.